The combination of matey celebs and dubious claims is enough to get me reaching for the sickbag. Serial crusader and mockney cookbook flogger Jamie Oliver is back – and this time he’s got together with his celeb mates to launch a revolution. Will the barricades be going up around our cities? Will the masked ranks of the workers be marching in support of Comrade Jamieski’s plan to overthrow the fattened plutocrats of the global bourgeoisie? And the hammer which will bash our education system into shape? 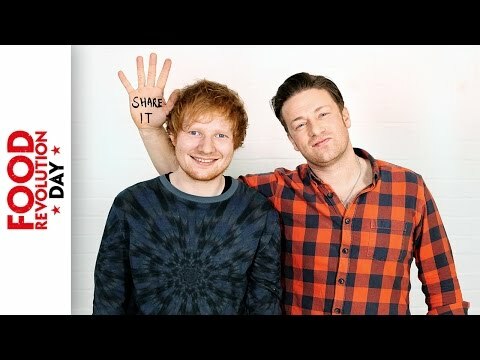 It’s a song, featuring Ed Sheeran, Alesha Dixon, Paul McCartney, Professor Green and more. I say ‘more’ because, frankly, I didn’t recognise half of them. Hugh Jackman is there, too, no doubt hoping to learn how to slice and dice organic vegetables with his Wolverine claws. It’s all washed down with a hearty dose of singing and clapping schoolchildren. If that sounds positively emetic, the accompanying music video is even worse in the watching. A quick perusal of the Food Revolution website reveals all the mainstays of a Jamie Oliver food campaign, reheated like last night’s pavement pizza. Patronising, matey tone? Check. Downright inaccurate factoids, like the claim that this generation will die at a younger age than their parents thanks to ‘diet-related disease’? Check. Heartstring-tugging appeals asking us to ‘think of the children’? Check. Simplistic solutions to the world’s problems? Check. Still, the campaign may do one thing to tackle obesity. It’s difficult to pile on the flab when you’re vomiting into a bucket.